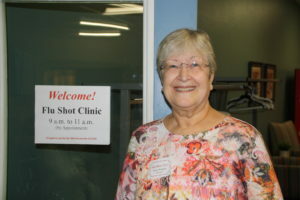 Time: By appointment only, 9:00 a.m. to 11:00 a.m.
Volunteer Diane Wingert greets people at the OCCOA Flu Shot Clinic. To Schedule: Please call the Health Department of Northwest Michigan at 1-800-432-4121 (same number as Dental Clinics North). The clinic is targeted toward older adults (age 65 and older) but is open to the public (age 18 and older). 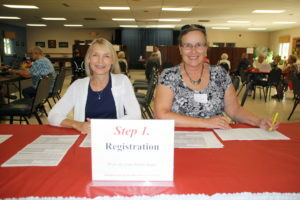 Volunteers Jean Lemon and Anita Wadsworth are ready to help at the Flu Shot Clinic. This year’s flu vaccine will protect against seasonal influenza. Those who need and qualify for the pneumonia vaccine will also have an opportunity to receive one at the clinic. Those wishing to receive the pneumonia vaccine should check on the necessity of one, beforehand, with their doctor. In addition to flu and pneumonia vaccines, clinic participants will have a chance to get caught up with their tetanus, diphtheria, and pertussis immunizations. Tdap (tetanus/diphtheria/pertussis – whooping cough) immunizations are available for those who need them. Persons wanting one should check with their doctor, beforehand, to find out if they are due for one. Lillian Putman gets ready to get her flu shot. The health department is especially concerned about getting all adults caught up with their pertussis (whooping cough) vaccines. Adults who have not kept current with their pertussis (whooping cough) immunizations, could unknowingly spread it to young children, who have not finished their full course of immunizations. For an adult, what may seem like just a cough from a bad cold sometimes ends up being whooping cough. This is a much more serious, or even fatal illness, for infants and small children.